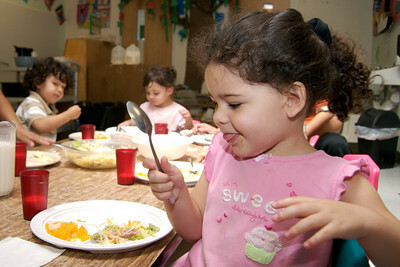 Southwest Child Care Early Learning Centers participate in the USDA’s Federal Child and Adult Food Program. We maintain a nutritious and well-rounded meal program that includes breakfast, lunch and an afternoon snack. We also provide supper for our FlexCare clients. Each location has a full-time professional cook that takes great care to serve nutritional, well-balanced food. This enables our children to develop healthy minds and bodies. Our meals are served ‘Family Style’ in a dining room with a strong emphasis on table manners and independence. The meals served are ‘Home Cooked’. We bake our muffins from scratch, hand dip our French Toast, layer our own Lasagnas and much more. We encourage our children to try and do new things each and every day.